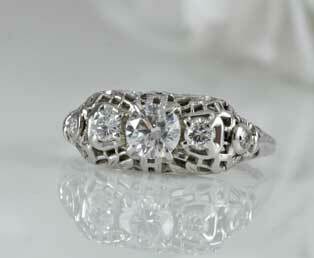 Five bright white diamonds pull your attention to this romantic 1930s estate diamond filigree wedding ring. Center stage is a gorgeous white diamond (color: E, Clarity: SI2) embellished by two vibrant side diamonds. Adding an extra dimension of beauty are two additional glistening bezel mounted diamonds transcending the sides of this romantic ring. This white gold Art Deco mounting has an open work filigree adorned with flowing leaf designs that join together. This ring shank is garnished with an engraved wheat design. Made in 18kt white gold.